Additional balloons or balloon animals in the LN2 if you want. Nitrogen (gas) makes up most of the air we breathe (78% ). The balloon is full of air. Air is a gas. When you cool down a gas, the atoms start to slow down and hold on to each other. When the atoms slow down enough, they start to be attracted to each other. Eventually, they stick together and your gas turns into a liquid. A liquid takes up much less space than a gas. The air never leaves the balloon. When the atoms warm up, the liquid turns back into a gas. Avoid any skin contact with Liquid Nitrogen. NEVER reach into the LN2 with the cryo gloves. They are NOT waterproof, so the LN2 soaks into the glove. This traps it close to your skin and freezes your hand. Always use the tongs if you have to get something out from within the LN2. Remove watches and stuff from your hands and wrists when dealing with LN2. That way, it can't get trapped close to your skin. Always wear safety glasses in addition to the cryo gloves for LN2 demos. The main purpose for this is to demonstrate to the kids that everyone has to be careful when dealing with LN2. Nitrogen travels farther than water when spilled because it doesn't adhere to the warm surfaces. If you pour it out on the floor, it WILL reach the kids, and they will try to touch it. 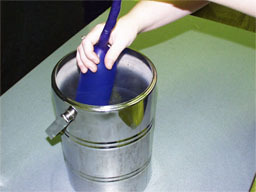 Always pour LN2 into a container or one of the Rubbermaid tub lids. Liquid Nitrogen freezes stuff. Examples are: people's hands or feet, expensive gymnasium floors. Just be aware of where you're pouring LN2 so you won't ruin anything important or expensive. The balloons often pop if the air expands before the rubber warms up. Show the audience Liquid Nitrogen by pouring it into a rubbermaid lid and watching it evaporate. Show them the balloon, and comment that it is full of air. See if they can remember what state of matter the air is. Ask them what will happen if you make the air in the balloon really cold. Then tell them you're going to do an experiment to find out. Explain that experiment means to try something and see what happens. Experiments are how scientists like us find out how things work. Put the balloon into the LN2. It works fastest if you push the end down to get more of the balloon under the surface of the LN2. As the balloon shrinks, tell the kids that as the air gets cold, the atoms start slowing down and holding on to each other. Now remind them that liquids take up less space than gases. The air inside has turned into a liquid. It is important to stress that the air never leaves the balloon, it just changes from a gas to a liquid inside. Then remove the balloon from the LN2. Explain that as the air warms up, it turns back into a gas. It is easy to prove this by watching the balloon expand. This also proves that the air has always been inside. If there are other balloons inside the dewar, toss them out and watch them all expand or pop as you explain this stuff. If some of the balloons pop, you might want to tell them that the rubber was still frozen when the air turned back into a gas. The rubber couldn't stretch, so the balloon pops.